Your house is a lot more than wood and plaster. It’s your family’s retreat from the world. You’ve worked hard to make your house a home. And there’s more to do. It’s time to get the facts on how to keep your family safe at home. 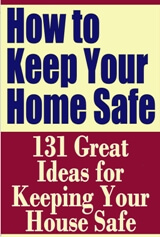 This guide will provide you with dozens of essential tips on home safety for you and your family. Do not place an electric appliance where it can fall in water. Never touch an electric appliance while you are standing in water. Don't place electric heaters near combustible materials. Alert your local police department if you discover downed power lines. Set up barricades to keep others away from the area until help arrives. A lightning protection system should offer an easy, direct path for the bolt to follow into the ground and thus prevent injury or damage while the bolt is traveling that path. Grounding rods (at least 2 for a small house) should be placed at opposite corners of the house. Keep an eye on large trees-even healthy ones-that could damage your house if felled in a storm. Cut them back if necessary. Store a lantern, pick, shovel, crowbar, hammer, screwdriver, and pliers in your storm shelter. If the exit becomes blocked you may have to dig your way out. Store canned food and bottled water, too. The basement is not a good shelter during a tornado because it's too close to gas pipes, sewer pipes, drains, and cesspool. A better shelter would be underground, far from the house (in case the roof falls) and away from the gas and sewer system. In a hurricane, don't go out unless you have to. However, if flooding threatens seek high ground and follow the instructions of civil defense personnel. Never spray insecticides near a flame, furnace, lighted stove, or pilot light. Keep insecticide sprays away from children, pets, dishes, foods, and cooking utensils. Avoid contact with the pesticide and don't inhale its fumes. When fumigating, use only the amount of pesticide required for the job. Change clothes after spraying, and store insecticides in a safe place. Never flush insecticides down the toilet, sewer, or drains. Never smoke while using pesticide, and wash your hands before handling a cigarette afterwards. As soon as you have used a space spray (bomb), leave the room. Close the room up tightly for at least half an hour, then ventilate. Do not reuse insecticide containers. Rinse and dispose of them. Never hang a chemically treated pest strip in a room where people will be present for any length of time, especially the sick, the elderly, or children. Plan to burgle yourself. In this game, you'll discover any weaknesses in your home protection that may have previously escaped your notice. Before turning your house key over to a professional housecleaner for several hours, make sure the person is honest and reputable as well as hard-working. Check all references thoroughly by telephone. If the housecleaner is from a firm, call your local Better Business Bureau to check on the firm's reputation. Make sure the firm insures its employees against accidents and theft. Instead of keeping a spare key in a mailbox, under the door mat, or on a nail behind the garage, wrap the key in foil-or put it in a 3Smm film can or a pipe tobacco can-and bury it where you can easily find it if you need it. If your plans to be away from home have been publicized through a funeral, wedding, or similar newspaper notice, hire a house sitter. Burglars often read the newspapers to see who's planning to be away from home all day or for several days. If a check or money is being sent to you, try to have a family member at home when the mail arrives. Try to vary your daily schedule of departures and arrivals, etc. so that your schedule is not easily predictable. Ask your neighbors to use your garbage cans when you're on vacation, so your absence won't be so evident. Safeguard your home by not leaving notes for workmen or family members on the door. If you're going to be away from home for several days-or even for just one day-adjust your telephone ring to its lowest volume. To a prowler, an unanswered phone is a quick tip that your home is empty. Arrange to have newspaper delivery stopped when you're away from home, and have a neighbor pick up your mail. Let neighbors know of any suspicious-looking person or strange cars you notice lurking about. Keep your curtains drawn or remove valuables to rooms where they can't be seen from outside. To prevent burglars from stealing ladders stored outdoors, padlock them to something that cannot be moved. Trees located near windows, or shrubbery that might shield a burglar from view, can be major flaws in your home protection plan. Dogs are among the best deterrents to burglars; even a small, noisy dog can be effective-burglars do not like to have attention drawn to their presence. For the most effective alarm system, conceal all wiring. A burglar looks for places where he can disconnect the security system. A door with too much space between the door and the frame is an invitation for the burglar to use a jimmy. Reinforce such a door by attaching a panel of %-inch plywood or a piece of sheet metal to it. You can burglar-proof your glass patio doors by setting a pipe or metal bar in the inside bottom track of the door slide. The pipe should be the same length as the track. It's easy for a burglar to pry his way through rot, so replace rotted door frames with new, solid wood. It's simple for a thief to break glass panels and then reach in and open a doorknob from the inside. A door with glass panels should be either fortified or replaced. When putting window locks on, have all the locks keyed alike and give each family member a key. Keep a key near the window where children can get it (but a burglar can't reach it) in case of fire. After installing a window lock, drip some solder onto the screw heads. That will stop a burglar from unscrewing the lock after cutting a small hole in the window pane. It can be a problem to lock an aluminum sliding window in a ventilating position. A locking sliding window bolt allows high security as it foils entry even if the glass is broken. A spring-latch lock is easy prey for burglars who are "loiding" experts. Loiding is the method of slipping a plastic credit card against the latch tongue to depress it and unlock the door. A dead-bolt defies any such attack. It is only vulnerable when there is enough space between the door and its frame to allow an intruder to use power tools or a hacksaw. But using tools takes time-to the burglar's disadvantage. Change your lock cylinders from time to time, just in case someone has gotten hold of a set of your keys. If you lose your keys, change the cylinder immediately. When you move into a new house, it's a good idea to change all the locks and tumblers. In a rented house, install a double cylinder lock that requires a key to open it from the inside as well as from the outside. If a thief breaks through the panel and reaches in, he still has the lock to deal with instead of just a knob. afterwards with magnetic fastener or a similar device. However, be careful not to leave finger marks. You can keep your jewelry safe by installing a wall-outlet safe. When the safe is closed, it looks just like an electrical outlet. When buying a wall safe, be sure it's fireproof as well as burglar-proof. A chiseled-out space in the top of a door makes a great "safe" for small valuables. Or you might devise a hiding place in a false ceiling. obvious places such as mattresses, drawers, inside figurines, behind pictures, and under carpets. Hollow out the leg on a table or chair for hiding small objects. Drill from the bottom, then cap all the legs with rubber tips. Are you worried about someone entering your house through your attached garage? If the garage door lifts on a track a C-clamp can provide extra security since the door cannot be opened if you tighten the C-clamp on the track next to the roller. Another way to increase garage security is to install a peephole in the door separating the house from the garage. If you hear suspicious sounds, you can check without opening the door.